Over the holidays Sigma announced new teleconverters. 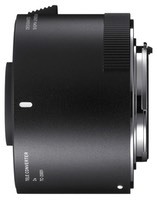 Curiously, the announcement was labeled “Sigma Tele Converter TC-1401 and TC-2001 Compatibility.” Hmm. The new converters are the TC-1401 (1.4x) and TC-2001 (2.0x). Thing is, they only work on a few lenses (120-300mm and both 150-600mm models). More importantly, it appears that you’re in an either/or situation with at least the 120-300mm: if you update your lens firmware to be compatible with the new converters, it becomes incompatible with the older 1.4x EX DG and 2x EX DG converters. Yes, confusing. The new TC-1401 is seven elements in five groups (up from 5 in 3), slightly heavier, and works with recent Nikon cameras at f/8. The new converter is also dust and splash proof. The new TC-2001 is ten elements in five groups (up from 6 in 5), and features the same more modern construction.